Note: These order forms are for you to download & take orders and payments with. You can then EASILY place your order right on our website. Scan and email to everyone on your list! Note: Idea: Scan & Email For Orders! We will be happy to send you a .pdf of your chosen design for you to put with downloaded order form or on an order form. Contact Us with your request for order form design below. Please allow 1-3 business days for your form. Fundraising sport car decals magnets. Custom car sport decals. Custom car sport magnets. Custom fundraising car decals. Custom fundraising car magnets. 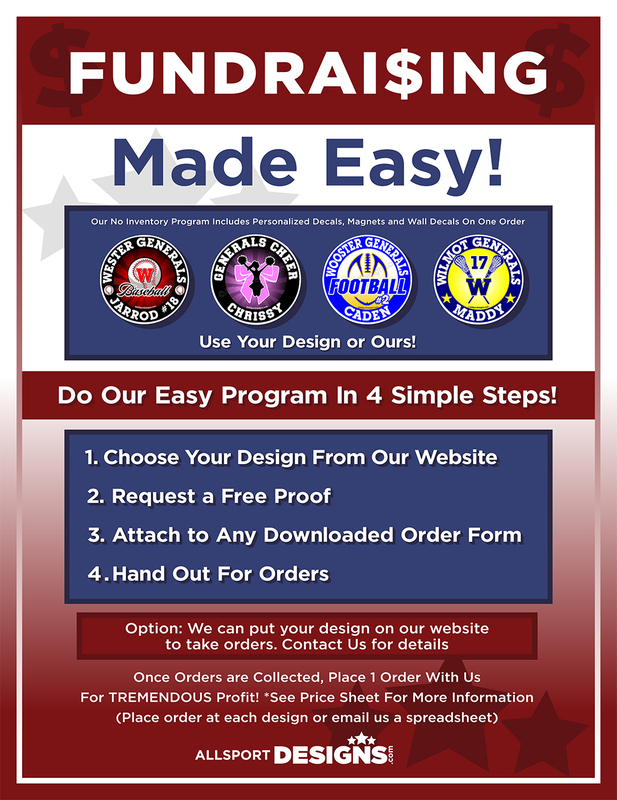 to assist you as we have artwork for any sport or occasion like business logo custom decals and magnets. Yes! We can do your logo too! Upload here. We've been in business since 1981 as a commercial sign shop www.signdesignwooster.com. We went online with our quality designs, commercial grade vinyl and .030 mil magnets which are made specifically for cars and lockers. We hope to give you the BEST service and quality around! We promise you WON'T be disappointed! Please be sure to check out our reviews at every design page and our testimonials page here. Thank you!